You don’t have to edit your documents using one software, and deliver them using another. 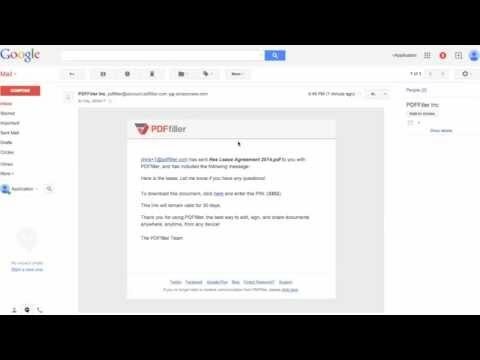 You can deliver your PDF forms directly from PDFfiller. If you edit and email a dozen documents a day, PDFfiller could save you a lot of time. When you finish editing a PDF document, click the Done button and select Email / SMS from the drop-down menu. Alternatively, select the document in MY DOCS and click Email / SMS in the right pane. Add recipients and write them a message. You can send yourself a copy of the document. You can deliver the entire document or only some pages. Select the pages you want to send in the page preview pane, use Select All and Unselect All buttons. In addition, you can change document’s properties such as page orientation, paper size and quality. Click Settings, make your choice and press OK. Finally, press the orange Send Email button in the top right corner of the page. The recipients will receive your email with a link to the document on PDFfiller; they will not be able to edit the document but will be able to save, print, send, and fax it. If you like being able to deliver your PDF forms from PDFfiller, you might be interested in a whole lot of other great features that PDFfiller has to offer. Some of these include editing, annotating, signing, faxing, and sharing documents. Check out these tutorials to see the other great things that PDFfiller can do for you! Can I get an iPad/iPhone App in Apple Store? Yes. You can download an iPad/iPhone App "PDFfiller" and "W-9 Form" in Apple Store to access and edit your PDF files from your mobile device. It's free and you do not need to pay more. Can I edit and deliver my PDF files on an iPad or iPhone? How can I edit and deliver my files from an iPhone or iPad? You can work on your files from iPhone or iPad using the application "PDFfiller". Just download an iPad/iPhone App "PDFfiller" and "W-9 Form" in Apple Store. Use the app to access and edit your PDF files from your mobile device. It's free and you do not need to pay more. How do I deliver "My Forms"? You can deliver your documents by selecting the "Email this form" button after you click the "Done" button in the Editor. Or from the "My Forms" page, you can also select the document and click the "Email" button. Input recipient's information and click the "Send Email" button. Can I send out my document after modifying? You can deliver your document by selecting the "Email this form" button after you click the "Done" button in the Editor. Or, you can also select the document and click the "Email" button. Input recipient's information and click the "Send Email" button. Can I deliver files after I'm done with editing? How do I know that my document has been received? Any document that you deliver to a recipient will be available to the recipient for retrieval for 30 days after you deliver it. How long does a sent document remain available for retrieval on the server? Yes. You can change the page orientation, quality and size in the printing setting dialog. Also, you can print only the text you entered. Can I retrieve my emails? Yes. You can retrieve your email status by clicking "History" button in the "My Forms" page and then the "email" button.